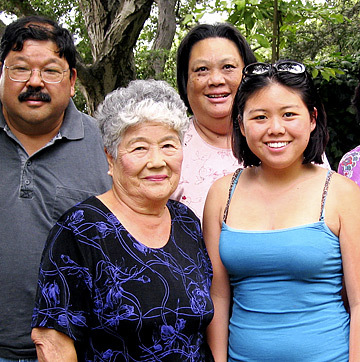 Jason Takamori, his mother Aiko Takamori, Colleen Takamori and Lianne Takamori are shown in this family photo. Funeral services for the Kapahulu couple who were among three people shot to death at a Tantalus lookout July 6 have been set for Friday. Jason and Colleen Takamori, both 53, were born in Honolulu. Jason Takamori was a plumber, plumbing teacher at Honolulu Community College and bass player with many local music groups. He graduated from Roosevelt High School, went to Kapiolani and Honolulu community colleges and trained as a trades teacher in Ypsilanti, Mich.
Colleen Takamori was a housewife and mother. She graduated from St. Francis High School and attended Kapiolani Community College. Shortly after marrying, the couple worked together at a Takamori family restaurant in the Waikiki Grand Hotel, said Bob Calverley, who is married to Colleen Takamori's sister. Adam Mau-Goffredo, 23, is being held on 18 felony charges for the three murders and a related home-invasion robbery on July 6. The Takamoris' daughter, Lianne, who had just returned to California after visiting her parents, talked to them on the telephone just minutes before they were killed. "She's really very grateful that she got to talk to them before they died," Calverley said. "That gives her, I think, some comfort." Calverley described his niece as "a very empathetic person" who was "closer to her parents than most kids are." He said despite her own grief Takamori "has a lot of feeling for the taxi driver's family." TheCab driver Manh The Nguyen, 50, was shot to death at the same time and place as the Takamoris, police said. Nguyen's services are scheduled for tomorrow at 9:30 a.m. at Borthwick Mortuary. Friends may call after 8:30 a.m. Nguyen is survived by wife Cynthia Lai, son Victor and daughter Christina. In addition to Lianne, the Takamoris are survived by Jason's mother, Aiko Takamori of Honolulu; Colleen's sister, Cynthia Lee Calverley of Thousand Oaks, Calif.; and Colleen's brother, Calvin Lee of Sterling, Colo.
Services for the Takamoris will be at 6 p.m. Friday at Mililani Memorial Park and Mortuary in Waipio. Visitation will be from 4 to 6 p.m. The family requests no flowers. Donations to help Lianne Takamori with expenses can be made at any American Savings Bank branch.